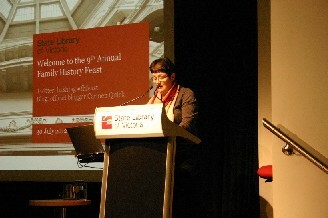 The videocast and complete written transcript of the 2012 Don Grant Lecture ‘Vandemonians in Victoria’ given by Professor Janet McCalman at the annual Family History Feast event held on 30 July has just been published on the State Library of Victoria website. In her Lecture Professor McCalman of the Founders & Survivors project reconstructs the fate of the men, women and children who emigrated to Victoria after serving time as convicts in Van Diemen’s Land. How many became founders? How many were survivors? Find out more in this this fascinating videocast. Professor Janet McCalman of the Founders and Survivors Project giving the 2012 Don Grant Lecture.